A scaled claim based on the date of commercial availability of a CPU microprocessor with a clock speed of 8.0 GHz or higher. 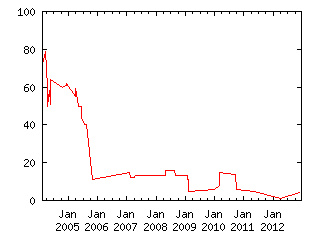 The claim value is based on the month of commercial availability, beginning with a value of 1.00 for January 2004, and declining by 0.01 per month. If a 8.0 GHz processor becomes available before January 2004, the payoff will be 1.00. If a 8.0 GHz processor does not become available until after April 2012, the payoff will be 0.00. A chart showing actual payoff values for each month is shown at the bottom of this description. A CPU microprocessor is defined as a chip designed to function as the general-purpose central processing unit controlling the majority of the operations of a personal computing device (desktop, laptop, server, handheld, or otherwise). Both RISC and CISC chips from any chip manufacturer are allowable under this claim. This claim excludes special-purpose chips that are not designed to run the general-purpose operations of an entire computing device. For example, graphics accelerators, sound processors, video processors, and specialized DSP chips would not qualify for this claim. I will judge this claim based on the commerical availability of the first 8 GHz or greater microprocessor released by *any* chip manufacturer.